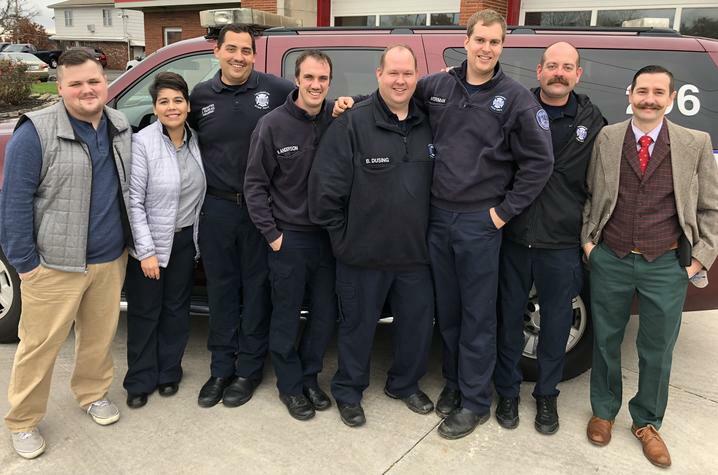 (Left to right) Ryan Blanton, Maria Slone, firefighter Brad Farkas, firefighter Matt Anderson, firefighter Brad Dusing, firefighter Pete Ackerman, firefighter Patrick Branam, Officer Alejandro Zaglul. LEXINGTON, Ky. (Nov. 13, 2018) — While most patients dial 911 for emergencies, there are a quite a few who have a habit of making unnecessary calls — for something as simple as falling out of bed. The numbers are staggering. In 2017, paramedics with the Lexington Fire Department responded to 48,238 medical calls. Only 266 people accounted for 8.9-percent of those calls. The Lexington Fire Department and students from the University of Kentucky College of Social Work have partnered in a pilot program to tackle the issue of non-emergency calls bombarding the 911 emergency system. In March, the city launched the Community Paramedicine Program. The goal? To save citizens, local government and private insurers thousands of dollars by reducing the numbers of runs for frequent callers or "super users." Capt. Seth Lockard, with the Lexington Fire Department, is in charge of the program. He said, the staff found themselves searching for agencies to help these patients get what they needed, everything from oxygen tanks to addiction recovery resources. In time, he turned to Allison Gibson, an assistant professor in the College of Social Work. Currently, two graduate students are part of the community paramedicine team. Ryan Blanton and Maria Slone work out of the old Lexington Fire Station 2 on East New Circle Road. They spend hours responding to referrals — which requires them to visit patients. Slone drives 2½ hours on Monday to work at the Community Paramedicine Program — a commitment she has grown to love. For Lockard, the addition of students from the College of Social Work just made sense. “It’s been a wonderful asset. A lot of what we are doing is navigation to resources. And I think they bring a lot of experience and knowledge that we wouldn’t have otherwise, because we aren’t social workers in any way, shape or form,” he said. And the numbers show the program is working.